There is a very common misconception among pet owners that animal teeth are stronger than human teeth – this is completely untrue! Canine teeth are very prone to fractures, which lead to pain, infection, and surgery (not to mention a big vet bill). 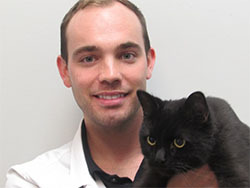 Dr. Fraser Hale, DVM, FAVD, DAVDC (veterinary dental specialist) recommends using his “kneecap rule” to help decide whether or not a toy is suitable for your pet. Simply put, the “kneecap rule” states that if you wouldn’t want someone to hit you over the kneecap with it, then your dog shouldn’t be chewing on it. 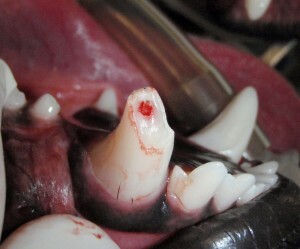 A broken tooth secondary to chewing a bone. The pink region in the center of the tooth is an exposed nerve, which is excruciatingly painful. Fractures like this require a root canal or surgical removal of the entire tooth. 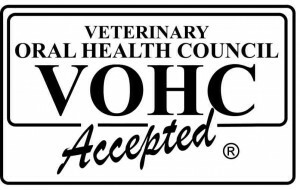 **Click here for more info on the VOHC seal of approval and what it really means. How much does your pet love his/her food? I’m guessing a lot. In fact, I’m willing to bet that eating is one of your pet’s favorite things to do. There are very few exceptions to this rule, and dental pain is not one of them. 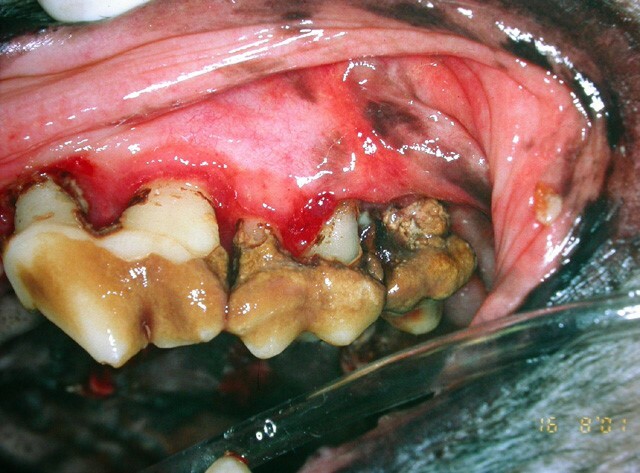 I have literally seen thousands of dogs with mild or moderate oral pain over the past few years, but I can only count on one hand the number of pets with so much dental pain that they stopped eating all together. The bottom line is this: a painful mouth isn’t enough to make your pet not want to eat. 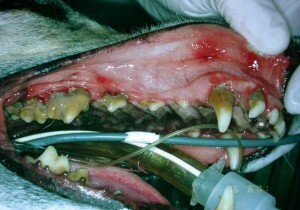 This is BY FAR the biggest myth in veterinary dentistry, and it also leads to the most frightening results. Non-professional dental scaling (NPDS) is illegal in Ontario, but many groomers (and human dental hygienists!) are offering it to clients as an alternative to a dental cleaning under anesthesia performed by a licenced vet. It involves scraping debris off the surface of the teeth while your pet is awake. Think of it like washing your car once a month, but never taking it in to a mechanic. It may look spectacular on the surface, but hiding under the hood there could be very serious issues that are left undiagnosed and untreated. NPDS is like that car wash – it removes visible tartar from the surface of the teeth, but what it fails to do is remove the disease-causing bacteria below the gum line and identify and treat other dental problems like infected teeth.